Our vision serves as the framework for our Roadmap and guides every aspect of our business by describing what we need to accomplish in order to continue achieving sustainable, quality growth. Our Roadmap starts with our mission, which is enduring. It declares our purpose as a company and serves as the standard against which we weigh our actions and decisions. "It is my pleasure to introduce HYSSNA INTERNATIONAL LLC as a leading interior contracting and designing company in UAE. Over three decades, HYSSNA has been providing a quality service to our customers who have been looking for a company that could provide excellent and competitive services. At HYSSNA, we are committed to produce prominent and innovative interior design solutions especially for your working atmosphere. We are specialized in designing, planning and implementing of both domestic and commercial interiors. We enjoy good reputation for quality designs and high skills within your own budget and time scale. HYSSNA is built a reputation for consistently achieving highly individual aesthetic results for a discerning local clientele. We place particular emphasis on understanding our clients’ requirements prior to producing design solutions, which often surpass expectations. Our enthusiastic and experienced professionals, approach each project as a new challenge. We offer different style and innovative approach in our design concept and solutions. HYSSNA has committed in completing each project to the highest standards, while taking on the challenge of capturing its unique individuality. We have extensive experience in materials and manufacturing techniques, both locally and internationally, and able to provide our clients with everything they aspire for, within the budget they choose. HYSSNA offers you total solutions for Turnkey Projects under one roof. If you have an idea or concept you would like to discuss why not give us a call and see how we can start to play an active role to fulfill the design of your choice and liking. HYSSNA CATERS TO UNDERSTANDING CLIENTS NEED & ADDRESSING THEIR NEED." Combining fresh and inspiring interior designs and architecture with an experienced and reliable service, Hyssna International can ensure that you are delivered a stunning project on time and in budget.All of our projects are director-led from start to finish with the support of our team of architects and creative and technical staff to ensure a personal yet professional service. We provide a flexible attitude allowing us to perform a key role as our client's consultant or work within the professional team providing a turn-key solution with individual services. Our strength lies with experienced finance and administrative Management, dedicated and specialized work force .We have well equipped highly Qualified, Efficient and motivated Team well versed with fully computerized environment for assuming total responsibility in terms of Integrated Management and Engineering Support. Efficient team of engineers and skilled Technicians for our, Mechanical, Electrical and Maintenance works. We work with fully computerized environment for assuming total responsibility for complete Services and maintain it throughout the completion of the projects. We endure to be the best through customer satisfaction. We at Hyssna International LLC respect the culture and values of the country and this is reflected within our company and the multination workforce we employ. Our interior design team is well infused with a collaborative spirit that has helped each of us produce competitive solutions for our clients. Bolstered by the finest design resources, our team approach proves that the sum of the whole is indeed greater than its parts. With more than 35 collective years of experience, our designers are devoted to surpass our clients' expectations and providing the best solution to the challenge at hand. Our teams knowledge and their area of expertise encompasses a wide range of interior design and turn-key projects. We have successfully completed several types of interior design projects from commercial, residential and institutional projects, to exhibition and furniture design, to landscaping. Each and every time, we have provided spectacular results to owners and stakeholders alike. Whether you need a 2D layout, a 3D perspective, a 3D animation or anything related to interior design; you can be absolutely confident that Hyssna is the right business partner for you to help you meet all your needs and realize all your desires. Hyssna Procurement Department is quality focused and responsible for the procurement and acquisition of goods and services that are necessary for the smooth functioning of the company. 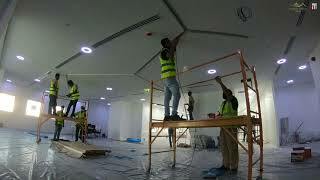 The Procurement Department is one of the key sector in the field of Interiors. Our procurement department mainly involves for procuring the materials for Projects. Procurement for Projects: In co-ordination with the concerned project managers, all loose fittings and FF&E, Floor, wall & Ceiling finishes, electrical lighting items required for the specified projects are procured globally through this division. Procuring goods and services from external suppliers can be a critical path for many projects. Often, the performance of the supplier will reflect on the performance of the overall project team. It's therefore crucial that we manage our supplier’s performance carefully, to ensure that they produce deliverables which meet our client’s expectations. The procurement process involves managing the order, receipt, review and approval of items from suppliers. A procurement process also specifies how the supplier relationships will be managed, to ensure a high level of service is received. This is a critical task helps us "get what client have paid for". We can ensure that the items provided meet the project need. It also helps us to manage the supplier relationship, ensuring that any issues are resolved quickly & get the maximum value from our supplier relationship. No matter the size or budget, estimating a project can be a daunting task. Every project request comes with a mystical, gray area that makes everyone nervous about expectations concerning cost, timelines, and level of effort. Because the grey area changes from project to project, there is no magical portion for creating a solid estimate. In order to create a workable estimate, you need to know your team, deliverables, tasks, and process like the back of your hand. You also have to be comfortable asking questions to figure out the things that you (and maybe even your potential client or customer) do not know. This chapter touches on best practices for creating project estimates grounded in your understanding of a project reality and being prepared for that alternate universe that eventually ends up in a change request. Get ready to learn a whole new set of dark arts, because you’re about to become the best project estimator in the business. Our Sales Team create value for clients, stakeholders and communities by taking a leadership role in the built environment, working in a sustainable and responsible way and by making a positive impact in the lives of people in the looking for a better design concept. "Mr. Robin Francisco is Hyssna’s PLANNING MANAGER. He is a Qualified and Competent Planning Engineer who has vast experience in the field of Construction and Interior Fit Out." We aspire to deliver a consistent relationship to our client and our main focus is to deliver the Project on Time and in Budget. Being part of the Team, we build a Contractual Construction Schedule using a Project Software(Primavera P6), whereby a comprehensive process has to take over and start with defining the Activities, Estimating Activity Resource and Estimating Activity Duration. This data are the initial calculation forming a Project Schedule in sequence of EPS(Enterprise Project Schedule), and creating a new Project, to commence a WBS(Work Breakdown Structure) and breaks into its defined activities with its logical relationship loaded with resource (Labor, Non Labor and Material) and considering all Contractual Milestone Obligation a comprehensive meticulous Construction Program is formed giving its insights to a World of Planning & Monitoring with keep track Reports of Earned Value Management (Cost & Man days) Weekly and Monthly basis. Interior finishing is a matter of ‘sequence’. Schedule activity sequencing is to be planned under scrutiny for each and every area. This would be of course an iterative task for fit-out PLANNING ENGINEER . While brainstorming is advisable, fit-out PLANNING ENGINEER is the one to determine the final sequence, as most of the trades would prefer to be the last performer on the scene. The elaborated activity sequencing is not just for large-scale projects, as it is a matter of how sophisticated the design is. Moreover, accurate planning and implementation of activity sequencing can fundamentally reduce the site damages as, given the vulnerability of the finishing material, the majority of the damages during the construction stage is due to ‘out of sequence’ site works. Professional fit-out management does result in significant reduction of touch-up works at the end of the project, which sometimes seems an endless task due to the extent of the damages that have occurred. The other crucial aspect of fit-out management is the ‘recourse calendar’, which is to be elaborately reconciled and incorporated into the project programme. In sophisticated designed projects, global suppliers are selected. Therefore their calendar, in terms of holidays as well as climate and timing, shall be taken into account. It also provides a rigid guideline for the designer and client with regard to the timeframe for the detailed design and material specification for the project. PLANNING ENGINEER has to be proactive enough to tackle the obstacles arising as the result of aforesaid reconciliation. Mr. Yazeed Alhilalie -Senior Project Manager-– Head of Projects a dynamic professional holding master's degree in project management as well as business administration from Wollongong Australia, certified in PRINCE2®, Change Management & Operation Management, BA in Architect & interior with 15+years diversified experienced as Director/Project Manager in construction, fit out, consulting, projects, architectural & interior design. Establish accurate project standards, documentation and information to be utilized and coordinated throughout the phases. Coordinate project schedule milestones within the project’s scope, time and budget while maintaining the Design intent, work quality and client expectations. Coordination of design intent with contractor, structural, MEP & T, and other various consultants. Coordination or production of specification manual when required. Construction document review (mark-ups) and quality assurance. Coordinate and collaborate in value engineering process when required. Attend consultant and construction coordination meetings, and relaying info back to General Manager in form of minutes and /or scheduled meetings. Answering and reviewing RFI’s, change orders, shop drawings, site instructions with the assistance when required. Site administration, visits, meetings, documentation of site progress & condition. Quality control of site work. CAD Standards: establish, evolve and maintain construction standards. Assist in creating and archiving the templates and typical details for future project use for internal database. Utilize established standard steps and process on how to issue and archive drawings and specs. Mentor project managers, project designer and technicians. Initiate opportunities to increase the firm’s design capabilities. Create sound relationships with colleagues, clients, contractors, and suppliers, to promote repeat business. Manage personal and team time to project schedules. Project scope and budget management. Quality assurance and risk management. Act as client and consultant contact throughout the construction documentation and contract administration phases. Responsible for project close out and integration. Assign tasks and schedule deliverables to project designers and technicians. Review team timesheets; if required. It is essential that one person is appointed to carry out the project management function. This person must be experienced in all aspects of the design and construction process and must be fully aware of the vital need to set up and maintain lines of communication and to prepare and manage the overall programme for the project. Through a series of formal meetings with all members of the design and construction team, he shall ensure that the Client's requirements are continuously reviewed and his objectives satisfied. Whoever carries out this role will act as the single point of contact between the Client and the Hyssna team and will advise the Client on technical and programme aspects of the project, and will execute the discussions and instructions of the Client. With the aid of finite dates on the master programme and by consultation with all the members of the design team, the Project Manager will also manage the Client's actions to ensure that no slippage occurs on the programme. By analysis, at an early stage of the various duties of the team members and by allocating realistic time scales for the work, the Project Manager will prepare a control programme for use as a management tool, ensuring that all Client's and project team's activities are monitored and kept on the critical path. Should the programme need to change due to unforeseen circumstances, then the Project Manager will endeavour to re-programme the various key activities to maintain the critical dates. We would then produce a precise master programme when formal dates have been agreed. Using our knowledge and experience within the industry, we shall prepare a cost plan for two particular uses: to indicate an overall budget for the scheme for the Client's approval and to monitor any changes in cost as the design scheme develops. When scheme designs are finalized, a more detailed cost plan will be developed. The final contract costs should not exceed this agreed figure unless the Client requires variations to the scheme. In consultation with the design team, the Project Manager will assist in making applications for all permissions on behalf of the Client. As stated previously, fast track programmes often preclude obtaining approval prior to commencement to works on site. There will be continuing liaison between the Hyssna Design team, Project Manager and services design/contractors to ensure full and effective co-ordination of the design and construction of the works. 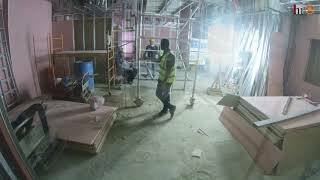 Continuous monitoring of the progress, quality of workmanship and costs throughout the duration of the works on site will ensure that successful completion is achieved. Alternative courses of action will be advised should any problems be identified as matters progress. Progress reports will be issued to the Client on a regular basis and will include anticipated final costs and any variation costs agreed as requested. In conjunction with other consultants, the completed works will be inspected, a list of defective items will be issued and monitoring of the rectification of those defects will continue following handover of the fitted out space to the Client. Detailed information will be prepared in order to analyze all costs, including variations in order to agree the final account immediately upon completion of the works. Hyssna MEP Department to lead the effort in coordinating and managing the MEP trades on major Interior and Construction projects. As we turn another page in history, I would like to take this opportunity to express my profound gratitude to all our clients and business partners for their continued support and contributions to the success of Hyssna MEP Department through the years. We, at Hyssna MEP will certainly continue to do what we do best; to ensure the high level of excellence and quality in our MEP projects and in the delivery of value-added Maintenance services. Moreover, I would also like to emphasize that HYSSNA MEP will continue to invest in enhancing the level of Project Management, Design, Engineering, Procurement and maintain the high level of satisfaction of our clients, who we value as the most important assets of our company. "Mr Dennis Mutasa is Hyssna’s Occupational Health and Safety Manager .He is a trained and Competent Safety professional who has vast experience in the field of Safety and he holds several Safety Qualifications. He is also a member of well recognized Safety professional Bodies such as IOSH,OSHAD and ISQEM." Hyssna International LLC has an occupational Health and Safety Management System that is committed to providing a safe working environment for all its employees and the project staff whether office based or on site. Our HSE Manager Mr. Dennis Mutasa has taken all necessary precautions taken to provide safe systems of work, and to ensure that adequate instructions and information are available to enable potentially hazardous operations to be assessed and controlled. Facilities are being provided to maintain proper consultation between management and employees, via routine safety meetings and safety checks and toolbox talks. The company recognizes that early planning, effective prevention and control, use of personal protective equipment, accident reporting and good record keeping are all part of an effective safe management policy. Subcontractors are similarly bound by our Health and Safety policy and are required to perform risk assessments of their operations and conduct their work safely. Hyssna International LLC has a mandate to provide a safe working environment for their employees and subcontractors and have procedures in place for dealing with their sub-contractors. ensuring that no action or inaction by staff members is likely to cause harm to themselves or any other person. Any breaches of procedure, or dangerous situations, will be notified to the responsible party, and work on the activity ceases until corrective action is taken. First aid will be available to all on site and the first aiders will be identified. Emergency procedures will be dependent on the configuration and layout of permanent and temporary works, and will address at the least safe access/exit in the case of fire. Housekeeping and tidiness will be the responsibility of the Foreman. Subcontractors will be required to be involved in an effective housekeeping policy on site.Visitors will not be allowed on site without personal protection equipment and they will be accompanied always by Hyssna International LLC personnel. Details of safety responsibilities will be documented in the Project Safety Plan for both Hyssna International LLC staff and subcontractors. Subcontractors will be required to submit method statements or risk assessments, which will be subject to approval. The identification of materials, which require special handling, is also provided for in the safety plan together with precautions and responsibility for action. The control of substances hazardous to health will also be detailed. Over the years, joinery services have become very popular when it comes to home or office renovations. Choosing the best joinery manufacturing company will help you create unique designs in your home, stylish windows or folding doors for your office or home and other joinery wood work. There are a huge number of experts offering these services today. To ensure that you select the best one for your joinery needs, it is important to follow some of these guidelines. Hyssna Joinery is the best interior fit-out company which caters all the services pertaining to decoration from conceptualization to execution. In order to best serve our client, we are also engaged to all kinds of customized joinery works as it gives best result in the interior design for offices, thus meeting our clients’ satisfaction. The collaboration between our expertise in office interior works and joinery works made us the top quality interior fit-out company across the UAE. Hyssna Joinery customized various standard joinery works such kitchen doors, windows, cabinets, wooden panels, decorative ceiling design, wooden claddings, Podiums, kiosk, wardrobe, handrails, decorative wooden blinds, reception counter, LCD stands, skirting and wooden furniture. We work closely with architects, interior designers, to cater for the interior joinery requirements for home and business in Dubai and whole UAE. Hyssna Joinery is equipped with state of the art, modern high tech machinery. We make continued investments in machinery to give our customers the best quality and also improve our competitive lead time. Hyssna Joinery keeps up to date with new trends, ideas and innovative designs endeavoring to give customer satisfaction . We make to order so you have your joinery design always unique. Should you require any further information on our products please speak to our sales representatives that will happily assist you any way they can. Customer satisfaction is our main priority and we have built strong relationships with our customers over the years. Our customers can always rest assured they will get the best quality joinery products and services, at a competitive price and know that we appreciate their business. We always secure our clients interest with minimum resources & maximum effort. Our experienced Quantity surveyor covers the following activities with his skills and knowledge about current market situation in UAE. - Prepare tender and contract documents, including Bills of Quantities with the architect and/or the client. - Undertake cost analysis for repair and maintenance project work. - assist in establishing a client's requirements and undertake feasibility studies. - Perform risk, value management and cost control. - Advise on a procurement strategy. - Prepare and analyze costings for tenders. - Allocate work to subcontractors. - Provide advice on contractual claims. - Analyze outcomes and write detailed progress reports. - Value completed work and arrange payments. - Maintain awareness of the different building contracts in current use. - Understand the implications of health and safety regulations.